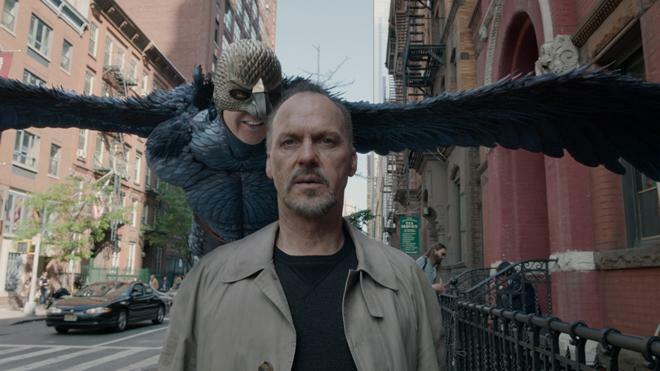 Birdman or The Unexpected Virtue of Ignorance is a black comedy that tells the story of an actor (Michael Keaton) -- famous for portraying an iconic superhero -- as he struggles to mount a Broadway play. In the days leading up to opening night, he battles his ego and attempts to recover his family, his career, and himself. A tiny dash on a single sheet of toilet paper. Compared to the vast expanse of space and time, that's all any of us really are. It's a rather humbling image, isn't it? And yet, we rage against our insignificance. Because we want to matter. Because we want to satiate that nagging, incessant voice in our heads, constantly lifting us up with hubris and crippling us with doubt. Fueled by the unstoppable, fragile force of ego and an unstoppable, continuous camera, Alejandro G. Inarritu's 'Birdman' is a singular cinematic achievement. Darkly funny, bitingly insightful, and visually mesmerizing, the film offers a backstage look into the contradictions of art and human nature, shining a spotlight on a man who just wants to be important. A man, who just wants to fly. 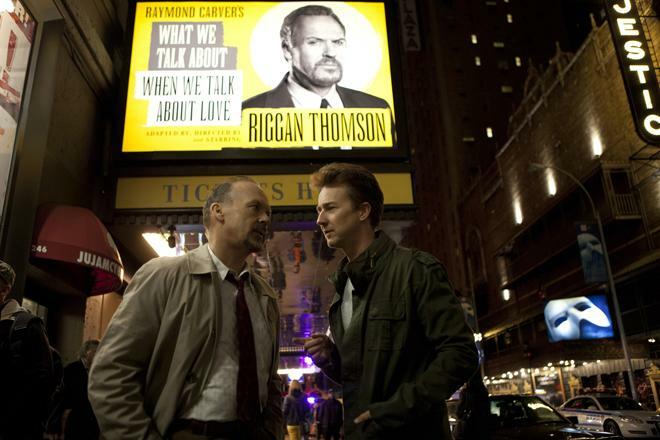 Riggan Thomson (Michael Keaton) is an aging, washed-up actor attempting to write, direct, and star in a Broadway adaptation of a Raymond Carver short story. Once popular for playing a big-screen superhero called "Birdman," Riggan hopes that his new endeavor will reinvigorate his career and grant him the artistic legitimacy he's always craved. But constant backstage disasters, family problems, and the looming shadow of his former comic book persona all threaten to derail his big opening. Can man and Birdman peacefully coexist? Or are these two dueling identities soaring toward a complete mental breakdown? Like its increasingly unhinged protagonist, this is a movie rife with conflicting ideologies, pitting concepts related to life and expression against each other in a satirical blend of dark humor, deep pathos, and magical realism. Using the clashing worlds of theater and Hollywood as his backdrop, Inarritu playfully examines the dichotomies of art and commerce, truth and illusion, and superficiality and pretension. Is it worse to sellout and be successful, or attempt something meaningful and fail? And just what defines success? Is it box office revenue or critical adoration? Or is it something deeper and more personal than that? Through Riggan's deteriorating quest for fulfillment, the director lampoons the pitfalls of artistic narcissism -- whether making big-budget blockbusters or low-budget vanity projects -- keeping his lens perpetually fixated on the violent ups and downs of the human ego. One minute Riggan is on a high of self-importance and the next his fragile facade comes crashing down to reveal a man overrun by insecurity. He's plagued by oscillating arrogance and doubt -- arrogance and doubt that take the form of a hallucinatory version of himself dressed in a rubber Bidman costume. Throughout it all, Michael Keaton turns in one of the best performances of his career -- and that's saying a lot. After all, this is Batman we're talking about. This is Beetlejuice (Beetlejuice, Beetlejuice!). This is Mr. Mom, damn it! Each setback builds and builds, and as the progressively surreal runtime goes on, Keaton coats the character in escalating frustration, keeping his mounting mania boiling just below the surface, only revealing hints of it through key glances, gestures, and momentary (telekinetic?) outbursts. And when he finally does embrace his wings once again, it's a thing of genuine beauty. The rest of the cast is equally mesmerizing, with an exceptional ensemble that includes Edward Norton, Emma Stone, Naomi Watts, Andrea Riceborough, Amy Ryan, and Zach Galifianakis. Norton and Stone are both particularly noteworthy, and the scenes they share together are surprisingly affecting. As Riggan's cynical and prickly daughter, Stone steals every scene she is in, revealing deep emotion behind a sarcastic exterior. And in the part of self-absorbed actor, Mike Shiner, Norton elicits laughs, tension, and even some genuine sympathy, creating a complicated character that is more than his surface flaws would have one believe. In fact, the same could be said for almost all of the script's characters -- Riggan especially. They're assholes, but they're assholes with layers. In other words, they're human. And really, what better way is there to observe humanity than uninterrupted? Choosing to forgo one of cinema's most basic and deceptive tools, Inarritu essentially does away with cuts, forgoing montage in favor of a fluid, continuous style. Using a free-flowing camera and hidden transitions, the majority of the movie is shot to look like one long, extended take. We start out on Riggan in his dressing room and follow his cast and crew until their play premieres days later without the camera ever cutting away. Through Inarritu's impressive extended takes, the movie attempts to achieve a level of truth in form that its characters can't seem to muster in life. And while this roaming aesthetic does give the film a certain improvisational feel, each movement is really the result of meticulous planning and rehearsal, all for the sake of creating an unrivaled sense of visual unity. By organically connecting each frame of the film into one evolving shot, the backstage world of the story is allowed to live and breathe like our own, letting every shifting image and performance inform one another. But even beyond the difficult logistics behind this technical achievement, a single take aesthetic does present some artistic challenges, especially when it comes to the movie's treatment of time. Though primarily presented as one shot, the film does not take place in real time. Instead, the narrative skips ahead at various points. While this might seem like a rather common occurrence, without the aid of cuts to help transition between days, Inarritu has had to rely on a different kind of cinematic grammar. A few time-lapse close-ups of the sky help to move us along, but several scenes rely on key pans, tracks, cranes, and sound cues to usher us through the passing hours. As the camera drifts away from one scene, the audio from another will start to creep in, and by the time the frame has settled on its new focus, we have managed to skip ahead in the story, using the camera's actual movement through space to help us move through time as well. For instance, one sequence features Norton and Stone's characters high above the stage where the lights are. After their scene is done, the camera drifts down to the stage uninterrupted only to find Norton's character already there in the middle of the play hours later. I know this probably sounds very simple, but in the wrong hands these roving temporal segues could have easily become confusing or disjointed. Instead, they're natural, effortless, and nearly invisible, complementing the director's chosen style perfectly. A style that manages to maintain an impressive level of cohesion between all of the movie's various complicated techniques and esoteric ideas. We all want to know that we exist. We all want to feel that we are loved. We all want to create something that stands the test of time and lives on long after we are gone. But as Riggan's ego constantly debates his path toward fame and success, we gradually realize that he's missing the point of what really makes being alive so special. Though this can be a decidedly caustic film, there is a genuine emotional center beneath all of its mocking satire and stylistic bravado. This is a movie that criticizes the empty explosions of Hollywood and the artistic self-indulgence of the theater in equal measure. This is a movie that criticizes criticism -- using irony to reveal the deep importance of sincerity and substance in life and art. A fascinating examination of the oscillating power and fragility of ego, 'Birdman' is one of contemporary cinema's most unique and refreshingly ambiguous efforts. Not just another tiny dash on a piece of toilet paper, it happens to be an exceptional tiny dash on a piece of toilet paper. And I sure hope that I'm not just "labeling." 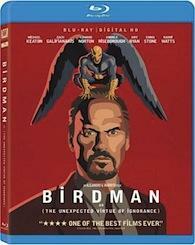 20th Century Fox brings 'Birdman' to Blu-ray on a BD-50 disc that comes housed in a keepcase with a cardboard slipcover. The slipcover features a Velcro flap that opens to reveal an image from the movie along with quotes from reviews. Instructions for an UltraViolet digital copy are included as well. After some skippable trailers, the screen transitions to a standard menu. The movie is provided with a 1080p/AVC MPEG-4 transfer in the 1.85:1 aspect ratio. Primarily shot on Arri's Alexa line of digital cameras, this is a gorgeous looking picture that highlights Emmanuel Lubezki's Academy Award winning cinematography beautifully. The digital source is essentially pristine with a light layer of grain-like noise. With that said, there is some very minor false contouring and a slight blurring in motion during isolated instances (Norton and Stone's rooftop scenes, in particular). Clarity is exceptional, with sharp fine details and intricate textures visible in faces, costumes, sets, and locations. The image also carries a pleasing level of dimension, giving the roaming camera shots a great sense of depth. Colors are also perfectly rendered, and the film's shifting palette transitions between the bold blue and red, and sickly yellow and green backstage lights of the theater to more natural hues, offering great pop and variety. Contrast is high without blooming, leading to bright whites and deep blacks with solid shadow delineation. 'Birdman' is a visually stunning movie, and the impressive camera work is preserved here wonderfully. There are some negligible issues here and there, but they all likely stem from the equipment and shooting methods used. The film is presented with an English DTS-HD MA 5.1 track along with optional English SDH, French, and Spanish subtitles. Layered and enveloping, this is a superb mix that enhances the free-flowing visuals with an equally living, breathing soundscape. Dialogue is clean, crisp, and well prioritized throughout, highlighting Birdman's gruff, intimidating voice with no balance issues to speak of. The bustling backstage world of the theater is fully realized, offering an intricate and spacious sense of atmosphere. Activity is conveyed from all corners of the room, extending the audio well beyond the edges of the frame. Doors close off in the distance, and character voices are spread directionally throughout the speakers as they frequently move about the sets and locations. Outdoor scenes also feature appropriately lively New York City ambiance, and one "action-scene" provides a playfully bombastic explosion of sound with some powerful rumble. The movie's indispensable drum score also comes through perfectly, layering a steady, jazzy rhythm beneath the camera movements. A few classical music selections sound lovely as well, revealing great dynamic range with no distortion. Immersive, nuanced, and deeply textured, the audio track presents a natural extension of the film's world, placing the audience right in the thick of Riggan's escalating chaos. Fox has provided a slim but solid assortment of supplements, including an insightful making of doc. All of the special features are presented in 1080p with Dolby Digital 2.0. Birdman: All-Access (HD, 33 min) – This is a very worthwhile behind-the-scenes look at the film's production with on-set footage, and cast & crew interviews. The participants discuss the movie's fluid visual style, characters, themes, effects, and sets. Likewise, we also get a peek at the rehearsal process and the massive planning that had to go into preparing for the film's extended takes. A Conversation with Michael Keaton and Alejandro G. Inarritu (HD, 14 min) – Here we get an interview with the star and director as they elaborate more on the film's themes, style, and characters. Gallery: Chivo's On-Set Photography (HD) – Here we get a gallery of 41 still photographs from the shoot. 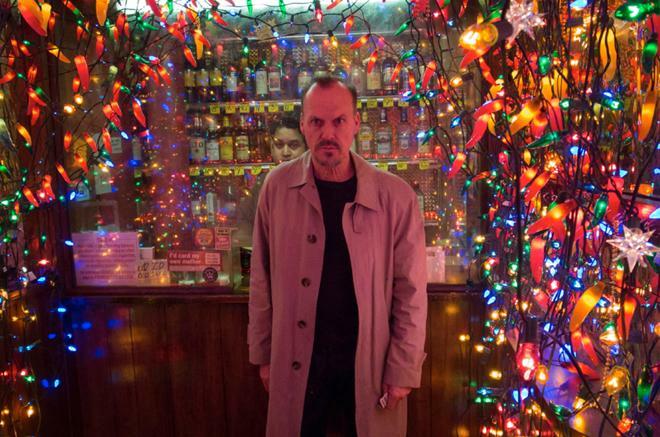 Alejandro G. Inarritu's 'Birdman' is a darkly humorous examination of human nature, art, and ego. Through mocking satire, sincere heart, and an incredible unblinking visual style, the director comes away with a genuine cinematic masterpiece. The video transfer and audio are both exceptional, highlighting the movie's impeccable cinematography and sound design. Though supplements are rather light, the included material offers several worthwhile insights into the film's impressive production. This is a well-deserving Best Picture winner and one of the movie industry's most unique films in years. Very highly recommended.